There are just two ways to get hurt. Number one, you can have an accident. With an accident you know exactly the moment it happens. There is an incident (i.e. a fall, collision, etc. ), a pain that accompanies it and you yell! This type of pain is referred to as acute pain. Number 1: That’s not true. Number 2: It can be really simple to understand why. I work to help athletes rebuild themselves. In general, I try very hard to make things simple. First, I look at movement quality. If I can just tell an athlete, “Don’t do that” and their movement patterns improves, then my job is done. In era filled with many differing schools of thought, I realize that things can get very confusing, complicated and misunderstood. Sometimes, just by coaching new patterns, a person become globally stronger which clears the pain and improves performance. Unfortunately, I normally see athletes that are already “beat up” and feel like there isn’t any hope. In the last year, I have seen more Crossfit athletes who have suffered the grueling pains of biceps tendonitis, rotator cuff tears, and labral tears than ever before. While some may think this is a mystery, I am going to quickly tie muscle physiology, basic human structure and posture together so we can have better understanding of how we create amazing physical specimens, as well as overuse pains during training. To first understand the origin of pain and shoulder injury we must first appreciate how muscles work. On a microscopic level, the contraction of a muscle is just a series of protein fibers that grab a hold to one another after the brain tells them to. Part of the adaption process we experience as athletes occurs when these fibers increase in diameter because the training demand is strong enough to force the body to do so. This what we call hypertrophy. This goes back to something we learned from Milo of Croton in 536 BC. For those of you who don’t know the history of this great Greek Olympian, he taught modern exercise physiologists about the overload principle when he carried a new born calf around Croton day after day, week after week, and month after month. As the calf got bigger, so did Milo’s strength. The end result was Milo becoming the great Greek wrestler and leading a land of many great Croton athletes. What Milo demonstrated more than 2500 years ago with his calf, is a principle that exercise physiologist and sport coaches use in training is called the S.A.I.D. principle. S.A.I.D. stands for specific adaptations to imposed demands. 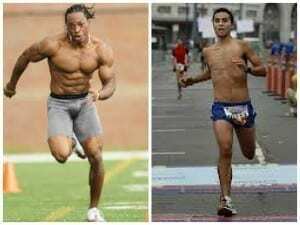 This is why an explosive sprinter has the body he does whereas a fatigue resistant long distance runner has the body he does. Now, I have yet to see any box post a calf to cow WOD, but as Crossfitters we do have a pot of functional movements that we select our programming from. We use these exercises with progressive loads and for increasing distances in the same way that Milo carried that baby calf. The list below includes 6 of the most common variations Crossfit exercises and the predominant reponsibility of the shoulder joint. The most common reason Crossfitters experience chronic reoccurring pain that just don’t seem to go away is overuse. Overuse doesn’t mean “exercising” too much. Overuse means having bones in the wrong places and doing the wrong things too much. The list above gives a general description of what the shoulder itself is doing during the exercises. You don’t have to be a biomechanist to see the predominant action that our muscles are making during these movements. This is probably a good time to share with you the four most common observations that I make when working with athletes who are experiencing shoulder pain. Each of these exercises place a different demand on the shoulder but what we need to consider is a heavy emphasis on the “first pull”. What we need to understand is that this “first pull” puts a heavy emphasis on the “shrug”. The shrug itself can dissected as an elevation of the shoulder girdle. 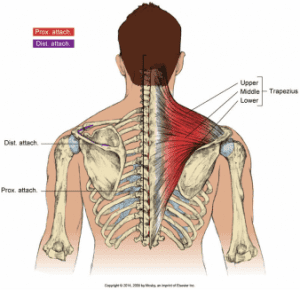 The prime mover for this movement is the upper trapezius. It is essential that we develop this action to be great at movements like clean, but a trend that I have noticed in athletes who are experiencing shoulder pains is an overdeveloped and dominant upper trapezius muscle. A weak lower trapezius naturally comes with a dominate upper trapezius. What we need to understand is that muscles are supposed to work in synergy. Meaning we are a sum of parts that work together to perform tasks that our brain asks them to. When a muscle is repeatedly asked to perform a task more often it can effectively put the neighboring muscle’s to sleep (lower threshold of activation). This is a principle know as synergistic dominance. 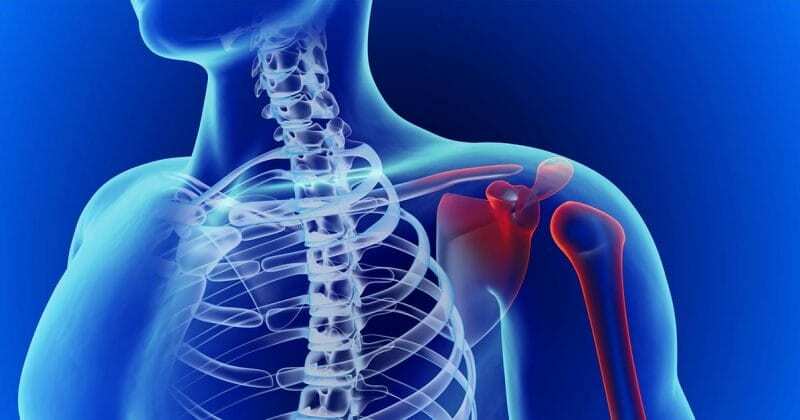 Having a weak trapezius is a problem for the shoulder because our scapula is largely responsible for the stability of the shoulder during the major movements we perform. The job of the lower trapezius is naturally the opposite of the upper trap’s in that it pulls the shoulder girdle downward. An observable phenomenon occurs when there is an imbalance between the upper and lower trapezius muscles. Remember that the primary concentric action if the upper trapezius is to elevate the shoulder girdle. When we lose the ability to depress our shoulder girdle because our upper trapezius is over-active, then the girdle itself becomes displaced in a forward position. This makes it look as if we have a pair of wings on our back, because our scapula pops off the rib cage. The problem with this lies the shape of the shoulder blade itself. This forward tilting crashes the scapula on to the top of the humerus and decreases the space in which it can move. Very often those with a protracted shoulder girdle will complain of impingement syndrome-type pains. The endpoint of these observations is poor posture. We have to appreciate the design of human to see just how simple of a concept this really is. First, realize that the shoulder is the union of the humerus (arm) and the scapula (shoulder blade). Understand that the scapula attaches to the rib cage and the rib cage attaches to the spine which attaches to the opposite side rib cage. This rib cage connects to the opposite side scapula and forms the opposite shoulder with the other arm. Essentially, what I am saying is that if there is dysfunction on one side of the body, there is going to be evidence (and maybe the culprit!) on the other side of the body. The coolest thing about understanding the body as kinetic chain, this is that we can see this. Vladamir Janda and others, labelled the common pattern of upper trapezius dominance as the upper crossed syndrome. The ability to identify this type of positioning and posture allows coaches and athletes to be both preventative and proactive in taking matters of muscular heath and performance enhancement into their own hands. At the end of the day, if can adopt some simple techniques to assess posture we can identify why people are hurting and not performing. The take home message is that muscles will only do what bones let them do. If your bones are out of place, then your muscles can’t function correctly.